Chateau / Country House37673 sq. ft.
1- YELLOW HOUSE small and cozy with 3 bedrooms, 2 with double bed (queen and standard) heated by thermal sheet, bedroom / living room with a bunk bed, living room with stove and wood stove / oven, equipped kitchen and hot water heated by serpentine or gas heating, 2 bathrooms, one with gas heating and bathtub and the other with gas heating or by serpentine From the wood stove. Tv led 39 'and tv 32'. In VillaMinas Space there are two properties (Chalet Loft Gourmet and Casa Amarela that sleeps up to 6 people) that can be rented separately or together. They are private, independent and are approximately 30 m apart. 3- The VillaMinas space features 3500 m2 of garden with hydrangeas, araucarias, squirrels, colorful birds and a stream of crystalline waters. outdoor grill and portable. Appliances and related items: refrigerator, stove 04 manual burners, microwave, blender, toaster, Nexpresso coffee machine, mixer, fondue pot, swiss mixer, cupcake maker, bread maker, mixer, pizza dishes, etc. In the garden lounger, picnic table, hammock, fixed grill, slackline. Become a kid again! Explore the garden, take a nap in the hammock and listen to the sounds of nature. Cool off in the stream and relax on the chaise lounger under the araucaria. Play a peteca, volley or ride a horse. Cook the organic products that you find here in the village at the house of the Joshua Neighbor (edible mushrooms, vegetables, jellies, wild hen) and in the Mantiqueira organic fair on Saturdays in Gonçalves, enjoy the sky full of Outdoor Stars! Particularities and tips: Here you will not get another cell phone operator other than VIVO MG. In GONCALVES there is a Banco do Brasil with ATM that only works until 20:00, there is a Bradesco ATM. Bring cash because some establishments do not accept cards, especially in the rural area. Bring cold clothes even if it's not autumn / winter, here at night It's always cold! 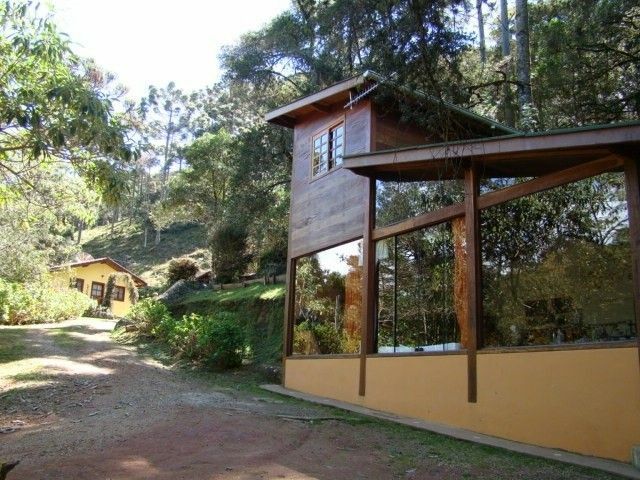 If you are coming by car, I suggest that you come from Carvalho Pinto or Dutra, to Taubaté and then take the highway to Campos do Jordão / South of Minas. Asphalt until Gonçalves, trip of about 3: 30hs, They will only take dirt road from Gonçalves to Terra Fria (8km = 15 min strolling). Otherwise you have the road through Fernão Dias, Cambuí (beginning of dirt road (about 40km), stream of the good Jesus, Bairro dos Costas, Gonçalves and it will be the same time of travel. Bathroom with bath and individual heating the gas and the other with electric shower, gas heating / or heating coil when used the wood stove that also heats the kitchen tap. In our living room the wood stove more than providing that tasty Comidinha also helps to keep the house warm, and the water from the kitchen faucet and bathroom. The secret is not missing wood and preferably not let the hot end, especially in the days of very cold! In the spring temperatures range from 11-20 degrees, Friozinho? In the winter of 2010 we came to -6 degrees entitled to frost. Eu e minha família nos apaixonamos pela Casa Amarela e por Gonçalves. As proprietárias foram muito cuidadosas e atenciosas desde o primeiro contato. Recebemos informações completas sobre a casa, dicas sobre a cidade e o mapa para se chegar ao espaço. A casa é exatamente como descrita no texto e nas fotos. Meus filhos adoraram tudo! Super recomendo para quem quer descansar e se conectar com a natureza! Claudia foi um prazer enorme receber você e sua família . Agradecemos esse carinhoso comentário e os cuidados que teve com a casa Amarela que agora e sua também . Desejamos poder recebe-la novamente e nos conhecernos pessoalmente . Simplesmente encantador!, o loft é muito bem equipado com todos os utensílios para uma ótima estadia. Limpo, organizado e com uma decoração rústica de ótimo bom gosto, oque nos propiciou momentos inesquecíveis. O amplo jardim possui espaço para churrasco, uma rede confortável e uma espreguiçadeira linda em madeira, além do córrego que passa na propriedade que é um charme a parte. O local é de fácil acesso, e a paisagem das montanhas que fazem parte do caminho tornam a viagem muito mais agradável. A proprietária Lucy desde o começo foi muito prestativa, nos passou todos os detalhes para que nossa estadia fosse tranquila, nos deu dicas de restaurantes e passeios oque nos possibilitou um melhor aproveitamento da cidade. Para quem gosta de estar em contato com a natureza esse é o lugar perfeito, e realmente foi pensando para tal, visto que até a pedra original do terreno foi mantida na concepção do projeto, oque o torna ainda mais especial. Além de tudo isso a proprietária possui uma cachorra adorável a Cristal além do rato.. apelido carinhoso dado ao cachorro da vizinha... Que sempre vinham fazer a festa conosco. Concerteza retornaremos!! Passamos três dias especiais em família na casa amarela. O local é tranquilo e a casa bem equipada, destaque para o fogao á lenha, uma graça. Os lencois termicos tambem fizeram sucesso e deixaram as camas quentinhas. Fomos muito bem recebidos pelas proprietárias que nos deixaram bastante á vontade. Já estamos com saudades. Pela segunda vez estivemos no Loft.Como da vez anterior foi tudo muito bom. Adoramos curtir o friozinho gostoso da região. No Loft tem tudo que precisamos. As meninas, anfitriãs fazem de tudo para deixar o loft e o jardim confortáveis para a gente. Cleo e Werner é sempre um prazer receber vocês! Não demorem pra voltar. E mais uma vez obrigada por cuidarem de tudo como se fossem de vocês . Passamos um final de semana maravilhoso na casa amarela, um lugar aconchegante, cheio de energia , silencioso, é o lugar ideal para quem quer curtir a natureza e repor as energias . Voltamos revigorados e com um gostinho de quero mais. E quanto as proprietárias Nelir e Lucy pessoas incríveis, encantadoras, receptivas, cuidadosas e extremamente prestativas. Voltaremos em breve. Apaixonante desde a entrada. Um jardim inspirador, romântico, aconchegante, com toque especial dado pelo rio que passa pela propriedade. A casa amarela é linda, rústica, bem decorada. E para quem se interessar pelo Loft, não perderá em nada, pois é tão especial quanto a casa amarela. Adoramos! Foi muito agradável compartilhar com vocês uma.noite de vinhos e raclette de queijos. Ficamos muito felizes de saber que curtiram bastante o pouco tempo que passaram aqui. Voltem logo. A casa amarela agora é de vocês também! Villa Minas space is located 8.1 km from Gonçalves center in the south of Minas Gerais, in the North Country neighborhood and is known in the circuit of green hills as the pearl of Mantiqueira! It's a town that provides nature lovers and sensational adventures ecotourism practitioners. Easy or difficult to access trails can be traveled by passenger cars or 4x4 vehicles, it is common, horseback riding, bike or even walking that lead to viewpoints on the famous rocks of the region. A dozen waterfalls are also part of the eco-adventure circuit: rafting, cascading, tree climbing, rock climbing are common practices in the region, but simply enjoy nature without much force is also possible, in fact almost a must. a) Restaurant Valley Mountain (breakfast, lunch and evening soup) is 1500metros Villa, meaning stone oven / Green hill. The owner is Simone. b) Restaurant Father Stone (Hot spots Stone Beveled, track medium access; beautiful view). c) Ouvidio Joe's Restaurant (Hot spots oven Stone, track medium access; beautiful view). These restaurants are homemade, mining and simple food. D) Neighbourhood sebastião the Three Ears, meaning Gonçalves, a villa of 2km has a grocery store, a bar and a bistro Flavors Mantiqueira with imported drinks, delicious edibles and 'Uai Fi' (wifi). E) **** restaurant Le Bistrot Gourmet and Simon Waterfall are 4.5 km from the Villa, meaning Goncalves. Sebastian Bar with live music.